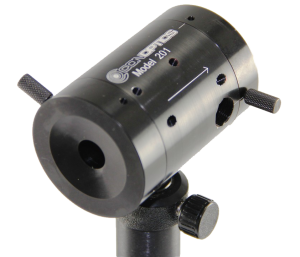 Conoptics has released the Model 201 Laser Attenuator / Power Splitter that permits the end user to split the laser beam exiting the Ti:Sapphire laser into (2) distinct beams and control the power for each instance. The Model 201 includes a polarizer which is a GLAN type design with an insertion loss < 4% and an extinction ratio of >100,000:1. In addition, the optics are designed so the angle of the escape port beam is fixed and will not change with wavelength variations. The internal achromatic ½ waveplate is also airspaced to allow for increased power and lower dispersion. The Model 201 is a valuable tool for MPM and Ti:Sapphire implementations.